In addition to hesed programs for senior adults, continued Mr. Botvinnik, Hesed Graham conducts a day care program for 28 small children considered at-risk. The youngsters are provided with three meals each day and a program that is rich in music and other forms of cultural expression, as well as socializing experiences. Mr. Botvinnik said that the program is very expensive to operate because it must provide transportation to children, many of whom live some distance away from the building. Situated on both banks of the Dnipr River in the northern part of the country, the origins of Kyiv are lost in antiquity. It is, however, known as the “mother of all Russian cities,” long pre-dating cities in Russia itself. Kyivan Rus – the city and territories around it - is considered the forerunner of the modern Russian state. In 988, Prince Volodymyr of Kyiv designated Orthodox (Byzantine rite) Christianity as the state religion of Russia and established its seat in Kyiv. Kyivan Rus attained its greatest powers in the eleventh and twelfth centuries when it was a trading center between the Baltic and Mediterranean seas. Sacked by Mongols in 1240, the lands of Kyivan Rus were successively under Tatar, Lithuanian, and Polish control from the fourteenth century and then annexed by Russia in 1686. The third largest city in the Union of Soviet Socialist Republics, Kyiv was occupied and almost completely destroyed by German forces between September 1941 and November 1943. Now the capital of independent Ukraine, Kyiv is the political hub of the country and an important center of Ukrainian commerce, industry, culture, and education. Increasingly, prominent businessmen from other parts of the country are relocating to Kyiv in order to be close to government, national financial institutions, and other critical national organizations. It is as well a magnet for younger people wishing to build careers in post-Soviet Ukraine. The 2011 population of the city is estimated at 2.8 million. 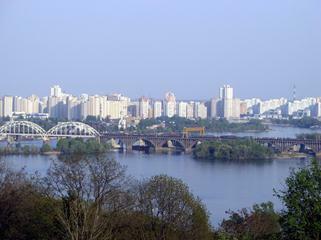 Densely packed new apartment buildings are typical of new developments on the east bank of the Dnipr River. Notwithstanding the relatively large size (26,000 to 70,000 people) of the Kyiv Jewish population, Jewish community life in the capital remains weak and lacking in spirit. Kyiv, said one observer, is a city of Jewish offices, but almost empty of Jewish life, as such. Rabbi Yaakov Dov Bleich, the Chief Rabbi of Kyiv and Ukraine, appears to be absent from the country on more days than he is present, and no other individual has emerged as a leader of Kyiv Jewry. The majority of Kyiv Jews remain aloof from all organized Jewish activity. Not only is there little noticeable dynamic Jewish life in Kyiv itself, but the capital seems to provide little stimulus or direction for Jewish life in the rest of the country. 56. The Orach Chaim day school (School #299), operating under the auspices of Rabbi Yaakov Dov Bleich, is the oldest of five Jewish day schools in Kyiv. It currently enrolls a total of about 200 pupils in grades one through 11, a significant decline from its peak enrollment of approximately 470. Boys’ and girls’ classes meet in separate buildings, each a former preschool located some distance from the center of the city. The general Jewish demographic decline is but one factor in the loss of pupils; the remote locations of the buildings, their lack of modernity, a secular curriculum that lags behind that of elite public and new private schools, the intensity of the Orthodox Jewish curriculum, the requirement that all pupils be halachically Jewish, and the single-gender education model are additional significant deterrents to greater enrollment. The need to maintain four separate buildings (schools for boys and for girls, dormitories for boys and for girls) imposes a major financial burden on the Orach Chaim system. The dormitories now accommodate approximately 20 youngsters, whereas they previously housed over 60 children. 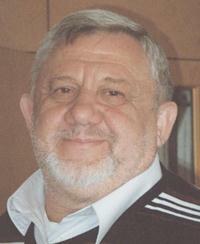 Khariton Gilgur, the veteran and respected principal of the school, expressed doubt about its future. The frequent and protracted absences of Rabbi Bleich, he said, contribute to a sense of drift in several of his endeavors, including the school. Among the most problematic issues is the “antiquated” state of the school buildings; Mr. Gilgur fears that they will fail periodic city inspections. A new stimulus to declare one or more of the buildings unsuitable is that the municipality now acknowledges a shortage of preschools. Authorities could force closure of an Orach Chaim building and return it to city control; after renovation, said Mr. Gilgur, it could be opened as a city preschool. Municipal education authorities impose a battery of tests to monitor student progress in city schools, said Mr. Gilgur. Orach Chaim pupils do well on these examinations, he continued; the school even has received academic achievement awards of new classroom technology and grants for travel to historic sites. However, he noted, the city is not obligated to pay salaries of teachers of secular classes with fewer than 30 pupils – and many Orach Chaim classes have only 20. The first grade has only 18 pupils. Orach Chaim cannot survive if it has to provide resources for the compensation of teachers of secular subjects, as well as religious subjects. All teachers are paid on time, said Mr. Gilgur. Some donors pay vendors, including food purveyors, directly without going through Orach Chaim. Mr. Gilgur is speaking with an American Jewish man who has lived in Kyiv for many years about potential support of the school, but does not know if this individual’s ideas would be acceptable to Rabbi Bleich. The Jewish studies curriculum now includes two classes (one in Hebrew and one in Jewish tradition) every day on Monday through Thursday, but only one class on Friday due to an early dismissal for Shabbat. Avi Chai supports several Shabbatonim every year, but payment for these programs is made through a bureaucratic process involving the Joint Distribution Committee. Management of the Avi Chai grant is very expensive, said Mr. Gilgur. Khariton Gilgur, right, has been principal of the Orach Chaim school since it was established in 1990. An additional 35 boys are enrolled in a related heder and 30 girls attend a related machon with an intensive Jewish studies course. Seventy children attend an associated preschool. The heder is located in a building adjacent to the synagogue, the machon is located in the girls’ school, and preschool classes are held in an Orach Chaim dormitory building. Generally, the government pays base salaries of all teachers of secular subjects. However, it is very common for Jewish day schools and other specialized schools to provide bonuses for the most gifted teachers as compensation for low state salaries. The Ministry of Education of the State of Israel pays salaries and other expenses for some Israeli instructors of Hebrew and religious subjects who teach in post-Soviet Jewish day schools.